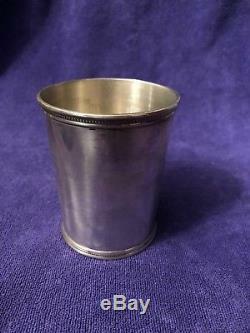 Scearce, Shelbyville, Kentucky sterling silver Mint Julep Cup DDE. Born from the rationing of silver during World War II and the tradition of English silversmiths. 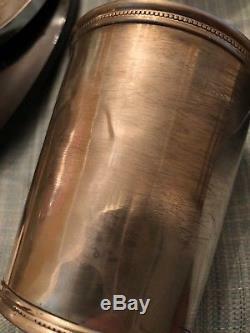 The Presidential Mint Julep Cup by Mark J. Scearce embodies tradition and opportunity. Scearce Holding Mint Julep Cup. Over the years, each new President of the United States has been sent a cup hand engraved on the side with the Presidential Seal. Today the cups continue to be given as gifts for special occasions, whether it be for a graduation, a wedding, a horse race victor, or as a special gesture of gratitude from the President to a dignitary. In fact, the ambassador to England, ordered a cup engraved with newborn Prince Georges name on it, as well as the date he was christened presented as a gift to the possible next King of England. Mint Juleps are the quintessential Kentucky Derby beverage, with approximately 120,000 consumed each year. One of the best descriptions of this magisterial concoction comes from Lieutenant General Simon Bolivar Buckner, Jr. In a letter written to General William D.
Connor dated March 30, 1937, the superintendent of the U. S Military Academy at West Point. In it, he is responding to the Generals request for the mint julep recipe. A mint julep is not the product of a formula. It is a ceremony and must be performed by a gentleman possessing a true sense of the artistic, a deep reverence for the ingredients, and a proper appreciation of the occasion. It is a rite that must not be entrusted to a novice, a statistician, nor a Yankee. It is a heritage of the Old South, an emblem of hospitality, and a vehicle in which noble minds can travel together upon the flower-strewn paths of happy and congenial thought. Deeply rooted in the heritage of the South, particularly in Kentucky, mint juleps and the silver cups they are served in have been the classic beverage for generations. The question ishow did our mint julep cups get their start? 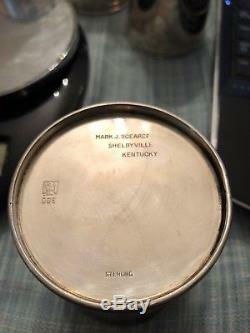 For my grandfather, Mark Scearce, it all began with an effort to obtain more Old American Silver. As a jeweler during World War II, he experienced first-hand the shortage of silver in America. He bought old pieces, and then found repair people to make them more appealing. 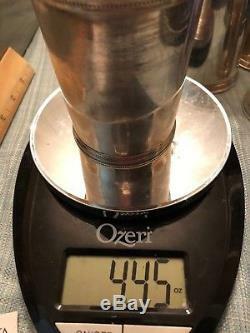 Finding the American coin silver julep cups fascinating, my grandfather had the desire to copy one of the early Kentucky models. A Quest to Accumulate Silver. My grandfather teamed up with local friend Paul Bartlett, a talented mechanic. Although neither one of them knew how to make silver items by hand, they managed to acquire silver working tools from a factory that had been dismantled to get started. Once the tools were acquired, the next step was a visit to one of the biggest and best smelting firms and suppliers of the time, Handy and Harman. Without an appointment, my grandfather boldly strode up to the receptionists at the plush office, asking to meet the president of the firm. Waiting hours for a meeting did not faze him, as he describes I might have a two or three hour wait since I had no appointment. I was determined, so I sat! After an honest and sincere appraisal, Mr. Neimeir took a great interest in the project going so far as to offer advice and several books on manufacturing to help get the job done. The meeting turned out to be a hugely successful venture, as Mr. Neimeir assured him that he would receive whatever amount of silver he needed. But other relationships proved to be much more beneficial, including the bond created with a silversmith by the name of E. That business relationship morphed into a friendship that lasted 30 years, lasting through to Mr. McAlpines grandson Jeds operation of the business. Eagle Cartouche & Presidential Initials. Our julep cups are distinguished by signature markings: an eagle cartouche combined with the initials of the current President. The design emulates the British hallmark system, which began in the 13th century. My grandfather wanted to create his version of the British hallmarks, an American play on the hallmark. The initials serve as a way to date the cups for posterity. 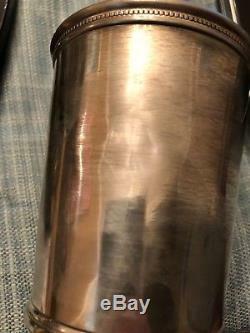 As the tradition goes, each new President receives a julep cup bearing their initials. Thus far, every President has sent personal letters of thanks, except for one. All of the letters can be seen on display at Wakefield-Scearce Galleries in Shelbyville, Kentucky. Countless other dignitaries have been the recipients of our mint julep cups, including a set for J. Perhaps the best customer we ever had was President Lyndon Johnson. After discovering our cups bearing his initials at a party hosted by Senator John Sparkman of Alabama, his secretary called for prices. He initially was not interested, but two weeks later personally called my grandfather. After a negotiation, another lasting relationship was established President Johnson wrote letters to him over the years, before making a larger request. At the end of October one year, he called to ask for 650 cups for Department of State gifts by December 15th. A typical Christmas required 100-150 cups, and this expansive order was compounded by the short turnaround time. When my grandfather told the President the order was too much in too little time, the Commander in Chief responded with Now Scearce, these are already in the plans and they must be in Washington by December 15th, gift wrapped for Christmas. I believe you can do it so get busy! The cups were delivered one full day early. A Gift for All Occasions. Our mint julep cups have been used by people and organizations from all walks of life, from a proud father wishing to commemorate the marriage of his daughter, all the way up to the President. Here in Kentucky, renowned Keeneland Race Course awards our cups as trophies to horse race winners, and has been doing so for 50 years. Frequently the cups are personalized, and are more commonly used for decoration than for drinking. The initials on the bottom have given the cups special status as a collectors item. After a given Presidential term concludes, those initials are retired for good. The production of our mint julep cups is completely driven by the market. If the cups are not ordered, they will not be made. In 1947, Mark Wakefield and Mark Scearce leased the extreme eastern portion of Science Hill known as The Chapel or Lecture Hall from Misses Juliet and Harriet Poynter. Wakefield retired from the business he helped found, but his name and his inspiration remained with the store. The property had fallen into disrepair since the schools closing in 1939. Indeed, the building had not even been painted in nearly forty years, and the plumbing and wiring, originally installed in the early 1900s, were dangerously antiquated. Thus, upon purchasing the property, Mr. Scearce launched an 18-month restoration in which nearly 75 miles of new wiring was laid, 14 miles of new copper plumbing was installed, and 700 gallons of paint was used in a single coating of the building. The entire property was given a complete facelift, but the original structure was carefully retained for historical authenticity. Only minor changes were made to adapt the six buildings for their modern day use. Between 1981 and 1982, Mr. Scearce launched a new 15-month restoration of the West Wing following the death of Miss Harriet Poynter in 1982 at the age of 99. Miss Juliet had died in 1974 at the age of 93. Upon the renovations completion in the Autumn of 1983, four new shops were opened to the public in what is now called the Poynter Wing. Today Science Hill is divided into three major sections: the Gallery, the Courtyard, and the Dining Room. The Courtyard is home to five shops that sell fashionable apparel, silver, linens, and even Christmas ornaments. The Dining Room makes use of the original kitchen and dining hall to serve dinner to any guest of this historic place. The sturdy masonry of Science Hill has protected its 78 rooms from wars, depressions, and natures ravages for nearly 200 years. During that time, millions have visited and studied under Science Hills care: Celebrities, dignitaries, young ladies with dreams of knowledge, diplomats, and orators have been our frequent guests. But the doors remain open to people from every walk of life who wish to relive a bit of the past. Historic Science Hill now houses one of the largest collections of. Its dining room is always full of good food and its shops are staffed by wonderful people. Todays genteel use of the Science Hill property is a fitting monument to a place so rich with history, housing auspicious institutions of education, culture, and gracious living for nearly 200 years. 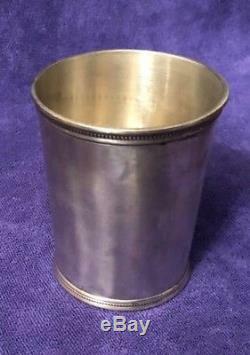 Scearce, Shelbyville, Kentucky sterling silver Mint Julep Cup DDE 1953" is in sale since Tuesday, July 24, 2018. This item is in the category "Antiques\Silver\Sterling Silver (. The seller is "thescottrowland" and is located in Peachtree City, Georgia. This item can be shipped to United States, Canada, United Kingdom, Denmark, Romania, Slovakia, Bulgaria, Czech republic, Finland, Hungary, Latvia, Lithuania, Malta, Estonia, Australia, Greece, Portugal, Cyprus, Slovenia, Japan, China, Sweden, Indonesia, Taiwan, South africa, Belgium, France, Hong Kong, Ireland, Netherlands, Poland, Spain, Italy, Germany, Austria, Israel, Mexico, New Zealand, Singapore, Switzerland, Norway, Saudi arabia, Ukraine, United arab emirates, Qatar, Kuwait, Bahrain, Croatia, Malaysia, Brazil, Chile, Colombia.